Automatic, touch-free flushing systems for toilets and urinals, keeps fixtures flushed and presentable, leaving washrooms looking and smelling clean. Easy 2 minute installation clamps over existing flush handle with no water shut off and no tools required for installation or replacement of batteries. Built in "daily flush" prevents sewer gas from escaping due. 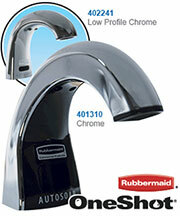 *Since the handle remains in place it can be easily turned back into a manual flush operation. No need to replace your current investment of flush valves or move plumbing rough-in to accommodate ADA compliance. Installing a battery operated automatic flushing device onto your existing flush valves makes economic sense. Installation of the AutoFlush is the easiest and most cost effective way to gain the benefits of an automatic flushing system - No more unflushed fixtures, foul odors, and damage from handle abuse by people not wanting to touch the handle. New angled sensor allows for user detection even with the toilet seat in the raised position. 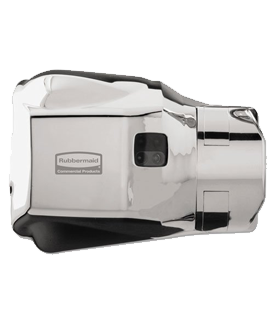 The AutoFlush infrared Object Lock Technology controls flushing like no other system today. You are able to match your flushing needs with the optimum in water conservation, sanitary environment for patrons and occupants of your facilities, and dependable performance. No water shut-off required and no plumber needed. Simply remove your existing flush handle with the supplied wrench, replace with your new AutoFlush unit, and tighten the collar nut with the same wrench. 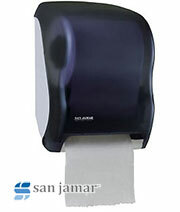 Insert supplied batteries, and you have just converted your restroom to a higher standard of hygiene. 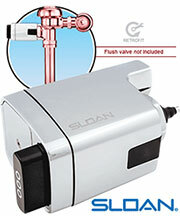 Fits Sloan Regal, Royal, and Zurn Flush Valves.